We’re practically giddy with anticipation as we approach our Two Days of Speedway Event on Thursday, November 29 and Friday, November 30. 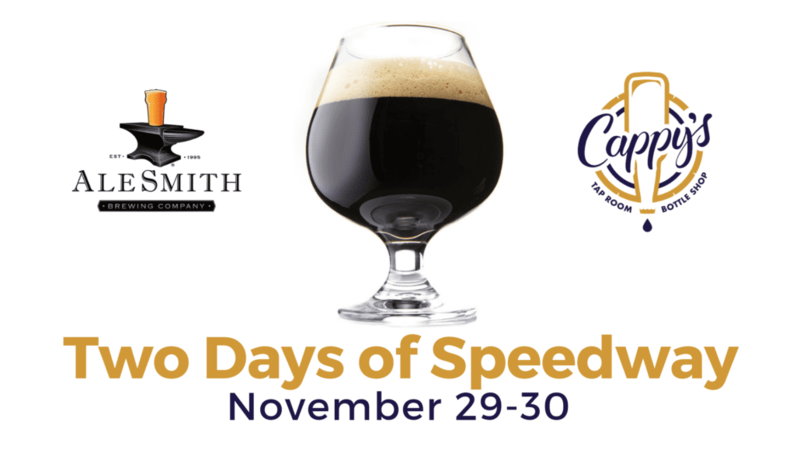 We’ve been huge fans of Speedway Stout from AleSmith since they started distributing in Ohio and we can’t wait to host what we think will be one of the biggest Speedway Stout Variant parties to grace the region. One of Ben’s personal favorite beers, we’ve always been proud of our practically permanent tap handle reserved for our Speedway Stout variants, but for the first time in Cappy’s history we’re tapping NINE Speedway Stout beers for one event. 2018 Barrel Aged Speedway Stout – Bourbon barrel-aged imperial stout with a massive flavor profile of Ryan Bros. Coffee, chocolate, and roasted barley. Mexican Speedway Stout – Tequila barrel-aged imperial stout with Mexican coffee, chocolate and cinnamon. 2017 Noble Empire – Brewed in celebration of AleSmith’s move to it’s second facility. Noble Empire is rich with chocolaty flavors derived from a variety of specialty malts. This beer has patiently found the delicate balance between sweet notes of vanilla and toast from the bourbon barrels. 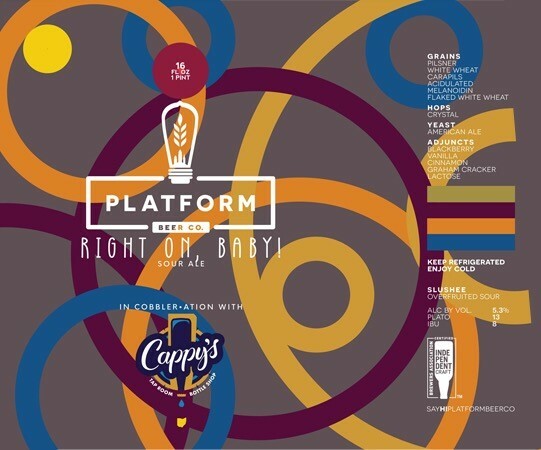 Introducing our first beer in the Cappy’s and Platform Cobbler-ation Series: Right On, Baby! This Blackberry Cobbler Overfruited Slushee Sour was brewed with blackberry puree, vanilla, cinnamon, graham crackers and lactose. The first in a series of collaboration beers (or as we like to say, cobbler-ation beers) between Cappy’s and Platform, the brew was inspired by one of our favorite All-American desserts – the cobbler. At Cappy’s we believe firmly in the glory of liquid dessert and we think this beer will pair perfectly not just with your Thanksgiving meal but with all the holiday get-togethers that come with this time of year. Keep an eye out on our social media pages for more information from Ben and Colin with Platform about how this limited release beer came to fruition. Our favorite day of the year is almost here! Black Friday, Baby! We’re excited to announce just SOME of the many rare and limited bottles available this year to our customers via our Toys for Tots Drive. As we get closer to the event, we will add additional bottles that are in the works. Important disclaimer: not all beers listed are currently in house. Our lineup is always subject to change. We will send out a fully updated and final list on Monday, November 19th. How do you land these sought after beers? By partaking in some #PhilanthropicBeerDrinking! 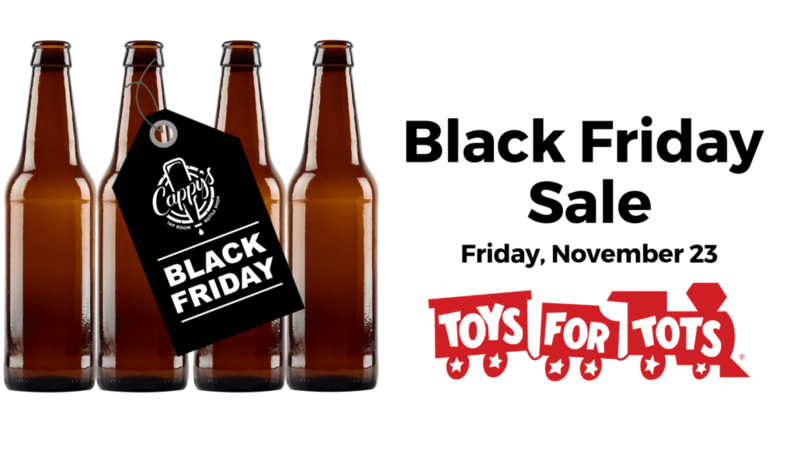 Customers earn the opportunity to purchase a bottle by donating a toy to Toys for Tots. Donate one toy, receive a voucher allowing you to purchase one of our rare bottles. Donate five toys, receive five vouchers. Customers may only purchase one of each bottle – no multiples. We have more in the works that aren’t QUITE ready to be advertised, but stay tuned and be sure to check out next week’s e-newsletter for updates to our lineup and another exciting beer-related announcement for Black Friday! ALSO, we’re adding WINE to our Black Friday Sale this year! 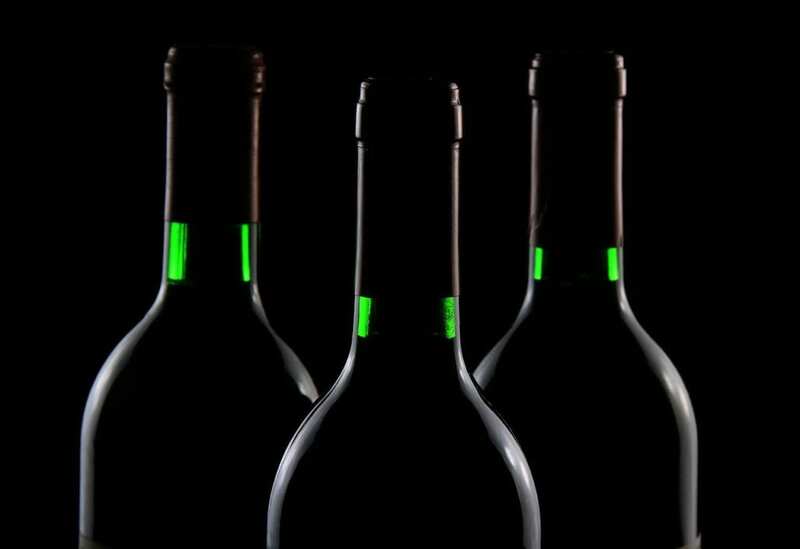 Details about rare and limited wines that will be made available for purchase on Black Friday will be shared soon. https://www.lovelandcappys.com/wp-content/uploads/2017/03/cappys_new_logo2.png 0 0 Kira Hinkle https://www.lovelandcappys.com/wp-content/uploads/2017/03/cappys_new_logo2.png Kira Hinkle2018-11-08 09:48:552018-11-08 09:48:55Black Friday, Baby! Aaah, the Teku glass. It’s the first glass to get snatched out of your kitchen cabinet for an impromptu bottle share for a reason. As far as beer drinking versatility goes, there’s nothing else quite like it. Manufactured by Rastal in Germany, Teku glasses were originally developed specifically for Baladin Brewery, a world famous craft brewery located in Northern Italy. The name comes directly from the masterminds behind this beautiful piece of stemware: Matterino “Teo” Musso, owner and head brewer of Baladin Brewry, and Lorenzo Dabove “Kuaska,” a die-hard, Italian craft beer enthusiast. The shape and design became an immediate sensation and the Teku is now considered a must-have glass for any true craft beer enthusiast. Developed specifically to amplify the multi-sensory experience that is craft beer, each line and angle was designed to heighten the flavor of the beer, but especially the aroma. Why is aroma so important? Smell is so closely connected to taste that how a beer smells will undoubtedly influence the flavor of a beer. Don’t believe us? A fun and easy at-home experiment for any beer drinker is to taste the same beer in different vessels. 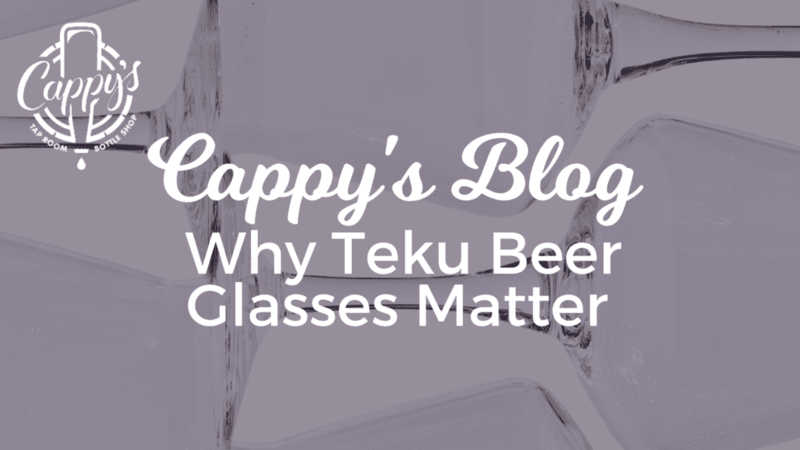 Crack open a can and divide up your beer into a juice glass, a snifter, and a teku. Be sure to keep some in the can for a full understanding of just how much your nose has control over your beer drinking experience. A modernized version of the traditional tulip glass, Tekus function at their peak when enjoying an IPA, pale ale, saison, or sour. Though regardless of style, in our opinion, it’s one of your best options on the market for glassware. The secret of the Teku lies in the angled bowl, which traps the aroma in the glass, allowing you to get a full whiff each and every time you take a sip. The stem isn’t just there so you feel fancy, but also to keep your body temperature from prematurely warming your beer. 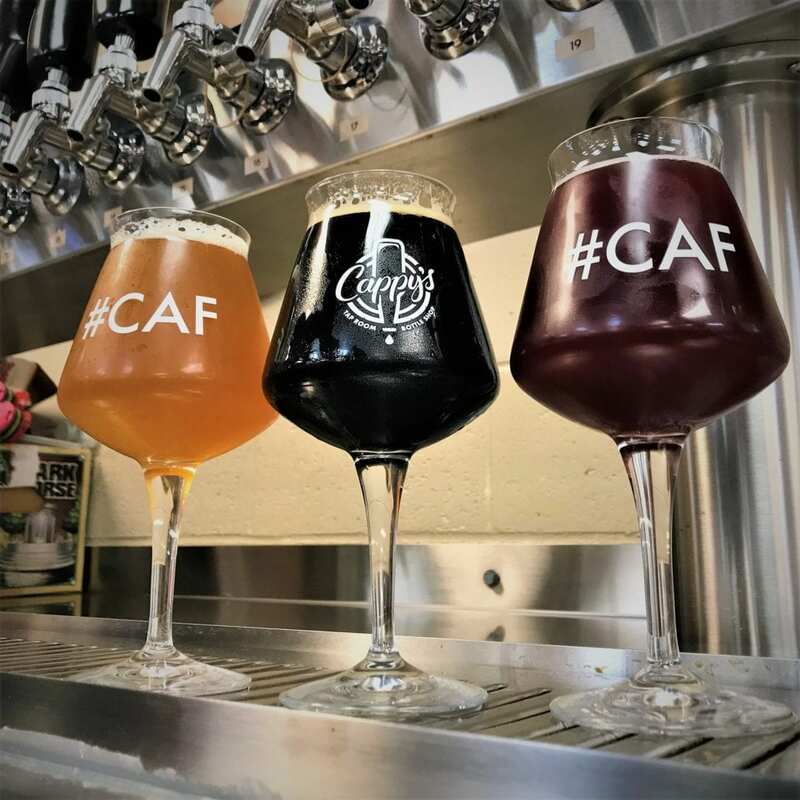 Now, while supplies last, pick up your very own #CAF Teku glass. Branded on one side with Cappy’s new logo and the other with our signature hashtag, these glasses were ordered in limited quantities and won’t be available for long. We’re serious about making sure our customers enjoy the best craft beer available, and that starts with proper glassware. #CAF Tekus are $15 each. 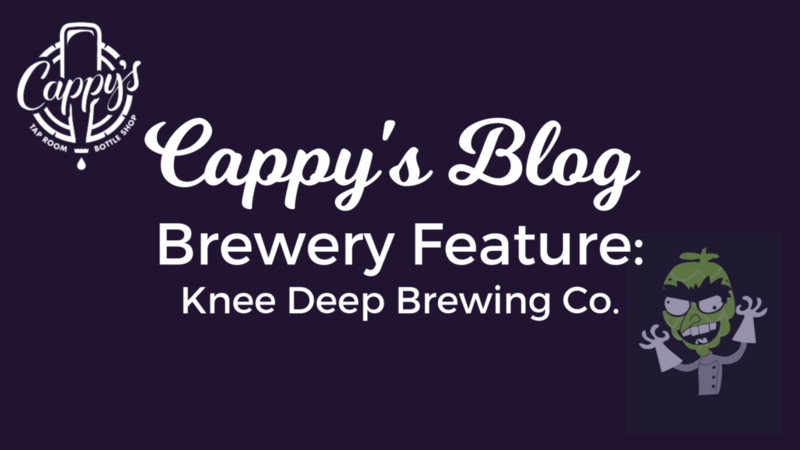 Tonight at Cappy’s we’re joining the guys at Knee Deep Brewing Co. and our friends at Premium to relaunch this incredible, award-winning brewery in Ohio. Knee Deep recently signed a distribution contract with Premium Beverage Supply. What does that mean for you? It means that you’ll be seeing their awesome beers on draft more often in the area along with a wider array of their beers in package on our shelves. So what’s the deal with this California brewery? The family-owned business got their start contract-brewing in 2010 near Lake Tahoe. They’ve grown over the years to a 28,000 square-foot facility just north of Sacramento. Known back in the day, locally, for selling the freshest beer possible, they used to sell growler fills directly from their loading dock. Talk about fresh hops! Rumor is that expansion is on the horizon in 2019. These guys have brought home a ton of hardware at various beer competitions including 2017 GABF Silver for Lupulin River. Interested in trying out their beers? Join us on the patio tonight, Wednesday, October 3rd from 5-10pm. You’ll have a chance to try some of their beers on tap, meet Jason and Danny from Knee Deep, and pick up some package from this brewery to-go. 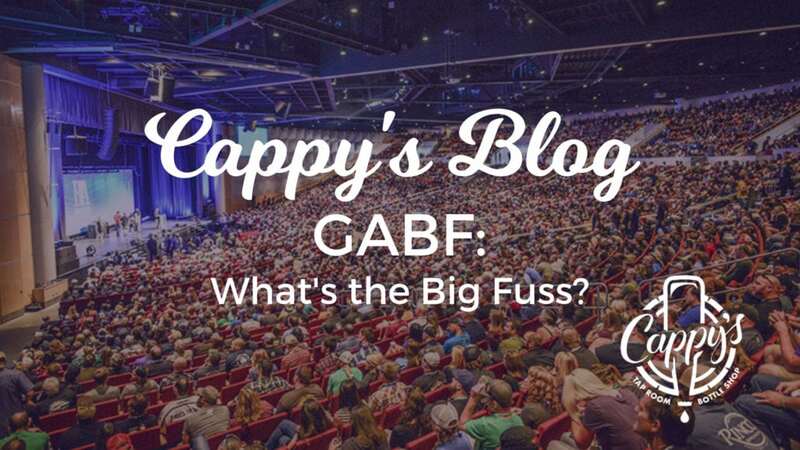 GABF: What’s the Big Fuss? If you happen to be at CVG in the next couple of days you may see an unusually high surge of travelers donning craft beer swag. Why are so many guys with epic beards suddenly popping up at the Cincinnati airport? Because it’s American Craft Beer’s high holiday – Great American Beer Festival! GABF is arguably one of the greatest craft beer festivals and competitions in the world and is in it’s 37th year. Hosted annually in Denver, Colorado by the Brewers Association, 62,000 craft beer enthusiasts flock to the convention center for this four-day event. With over 800 breweries pouring over 4,000 beers, it is no wonder that this event lives at the top of the craft beer drinker’s bucket list. Part festival, part competition, this event has it all. Oh, what a glorious sight to behold. This efficient and brilliantly run beer festival is a damn good time. Who wouldn’t want to be surrounded by equally nerdy beer enthusiasts from around the world while sampling the best of the best in craft?! New this year to GABF, the Brewers Association has reorganized the convention center so that breweries are organized in alphabetical order. We think this decision is a major win – gone are the years when you had to memorize the map in order to track down your must try beers for the night. Additionally, they’ve expanded the footprint of the festival by 100,000 square feet this year, which will hopefully help in moving around those epically long lines that pop up around big name breweries. This year 62,000 lucky attendees will have their pick from over 4,000 beers representing 800 breweries. Study the list and make some top picks before the session begins. But don’t stay married to your list. If you walk past a booth and something catches your eye, TRY IT! Even if you’ve never heard of it before. You may be tempted to stick to breweries that don’t distribute in Ohio, but we say there is something super exciting about connecting with your local breweries during GABF. Even if it is just to say “Hi,” visit the Cincinnati brewery booths and show them some Cincinnati love. GABF is all about love for and pride in the craft – so share in that positive energy! Water, water, water. And then remember that you’re at a high altitude, so more water. If you’re a loyal Untappd user, consider pre-loading your beers into the app for quick access and on-the-spot beer reviewing. Or take your notes on paper and spend your flight home updating your account. Worried that walking around with a notepad will make you look nerdy? You’re at a beer festival. It comes with the territory. Pay attention to beer events hosted at local craft beer bars and breweries. GABF is not just about the festival itself, but is about the city-wide craft beer party that happens all week long. The tap takeovers and other special events happening in Denver surrounding the festival are unreal and are not to be missed. All eyes are on this competition, so no pressure. With over 2,200 breweries submitting over 8,300 beers in 102 beer style categories, these judges have quite the challenge. Guidelines for judging are based on the Brewers Association Style Guidelines and World Beer Cup Styles. The constant evolution is very intentional on the part of the Brewers Association and adaptations to the categories are not taken lightly. There is a concerted effort to make sure that style categories are relevant and are a true reflection of the current beer landscape. Winners of the annual competition are announced on Saturday, September 22nd in a massive hall with brewers from around the country filling the seats. The awards show is fun to watch, even from a distance. We’ll share out livestreaming details closer to the event. Not able to make it to Denver but want to get in on the action? Join us for our GABF Preview with Fat Head’s on Thursday, September 20th. Cheers! https://www.lovelandcappys.com/wp-content/uploads/2017/03/cappys_new_logo2.png 0 0 Kira Hinkle https://www.lovelandcappys.com/wp-content/uploads/2017/03/cappys_new_logo2.png Kira Hinkle2018-09-19 08:41:052018-09-19 08:41:47GABF: What's the Big Fuss? Since March, we’ve been geeking out anytime a beer delivery includes a new release from Decadent Ales, and last week was no exception. Last week’s huge drop of Decadent cans, featuring five new beers from this nanobrewery in Upstate New York, took our adoration for this brewery to a whole new level. We’ve spent a lot of time this week scrolling through Decadent’s social media feeds and getting excited about what’s next from this new up-and-coming brewery that is killing the game. We were actually pretty shocked by the lack of information available online about this brewery and so we decided to do some digging of our own. Here’s what we know about the guys at Decadent Ales, a brewery that keeps surprising us and hooking us with their exciting flavor profiles, quirky can art, and finger-on-the-pulse approach to craft beer. Decadent Ales is still relatively new to the craft beer scene, founded in June of 2016 by Paul Pignataro, Jim LeRay, and Andrew LeRay. Located in Mamaroneck, NY, this Hudson Valley nanobrewery is already turning heads nationwide. Initially located in an 1,800 square foot space underneath a chocolate shop, the guys brewed on a one-barrel system. Focusing on New England style IPAs and dessert-inspired pastry stouts, their proximity to a chocolate shop seems pretty fitting to us. No surprise, they quickly outgrew their space and started conversations with Half Time Beverage to develop on-site brewing facilities and a tap room at the New York mega-retail shop. Decadent closed their initial location and moved to contract brewing, working with Thimble Island Brewing Company and Dorchester Brewing Company. The conversations and planning with Half Time Beverage continued, and in 2017 plans to build and move into the space began. Fast forward to Summer of 2018– the tanks are installed, and Decadent Ales is in their final stages of opening their tap room and new location. The current word on the street is that they’ll open in September, which means it’s time for everyone to start planning their next beercations to Upstate New York. What’s on the docket in terms of new beers from Decadent? It looks like they’re returning to some of their popular pastry stouts this Fall, are launching more milkshake IPAs, and have a few collaborations with Evil Twin in the works. As the humidity breaks (we hope), and we begin to look towards Fall, a surge of Oktoberfest beers are unloaded from trucks and appear on our shelves and in our coolers. As crushable as this style of beer is, however, these beers tend to bring with them a plethora of questions from our customers. So, crack open a cold one and settle in as we attempt to answer some of your Oktoberfest FAQs and explain a bit more about the brews that do this beer-focused celebration justice. How did Oktoberfest come to be? Oktoberfest was originally a massive, city-wide wedding celebration. In October of 1810, Crown Prince Ludwig married Princess Teresa of Sassonia-Hildburghausen. All of Munich was invited to feast and join in celebration of the newlywed couple. The evening closed with a horse race. A year later, the city of Munich decided to organize yet another horse race and the rest is history. The event itself has since been lengthened to a multi-day celebration and the festivities have moved up in the calendar to September. What exactly is a märzen? Märzen, which means March in German, was traditionally brewed in March, towards the end of the brewing season. Before the invention of refrigeration, brewing was limited to the cooler months, allowing beers to go through the proper fermentation process without risking bacterial infection. March was considered the final month in brewing season and this bottom-fermented lager was then stored in cellars until ready for consumption in late Summer and early Fall. Rich, full-bodied, and generally a bit higher in ABV, this German-style lager ranges anywhere from pale gold to amber in color. Expect bold, malty flavors and a clean, dry finish. 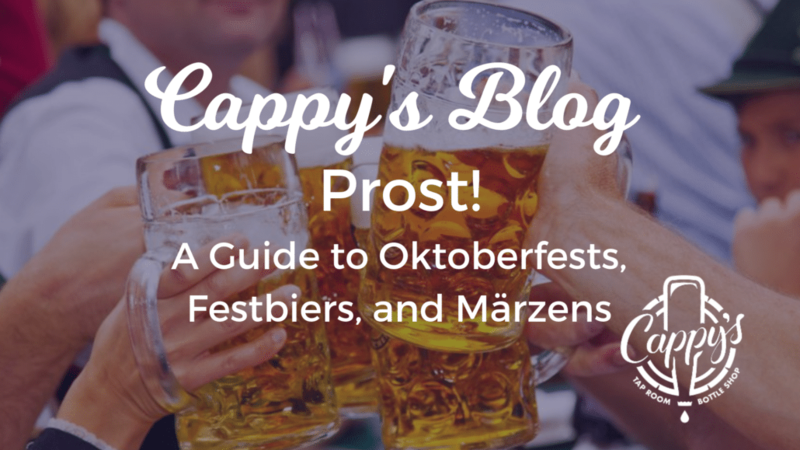 What’s the difference between an Oktoberfest beer, a festbier and a märzen? In Germany, technically, a beer can only be called an Oktoberfest beer if it is brewed in Munich and served during Oktoberfest. That means just six beers in the world are considered Oktoberfest beers: Augustiner-Bräu, Hacker-Pschorr-Bräu, Löwenbräu, Paulaner, Spatenbrä, and Staatliches Hofbräu-München. Pretty limiting, right? The official Oktoberfest beers tend to be a märzen style-lager, but in the 1970s, attempts were made to brew a beer similar in style, but lighter: enter the festbier – think of it as a seasonal dortmunder. Which Oktoberfest beer do you recommend? We each have our own personal favorites at Cappy’s, and so we’ve opted to give you the chance to determine the best local interpretation for yourself. Hesitant about committing to an entire six pack of a single märzen or festbier? Pick up our mixed six-pack of Ohio(ish) Oktoberfest Beers– perfect for an at-home blind taste test. Prost – site!